Have a Wire Decking question? 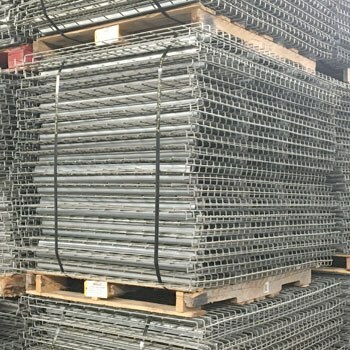 Steel wire mesh decking with steel support channels allow for the storage of open case items and pallets of inventory in the same sections of pallet rack. 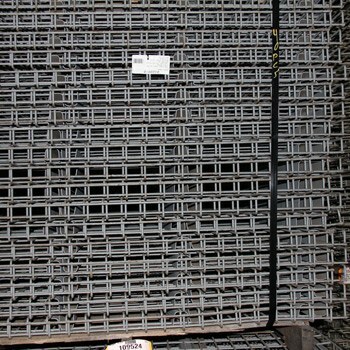 New and used wire deck helps protect against falling items that can cause worker injury and product damage. 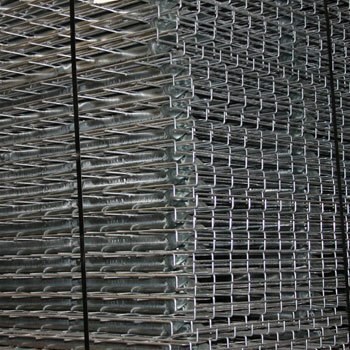 The open mesh of wire deck also provides additional lighting in dark warehouse aisles to easily identify stored inventory, improve the circulation of heating and cooling, and the unrestricted flow of sprinkler systems in case of fire. Wire decking is maintenance free and easy to install. Q. 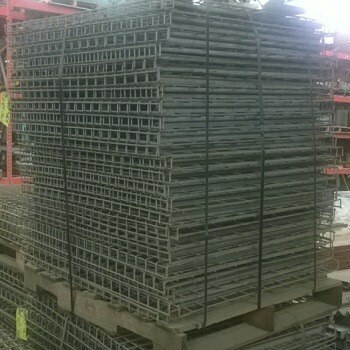 What style wire deck should I buy for my pallet rack? A. 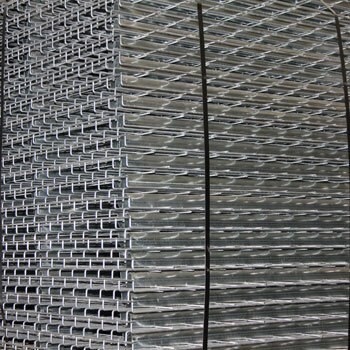 Wire deck comes in several different styles, including standard double waterfall, single waterfall, inside waterfall, and drop-in wire deck. 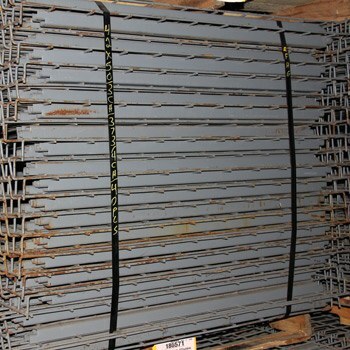 Single Waterfall's wire mesh is bent 90 degrees on the front and rests on the outside of the pallet rack beam. This provides stability, eliminates shifting and removes the chance of materials being snagged in a front crevice. 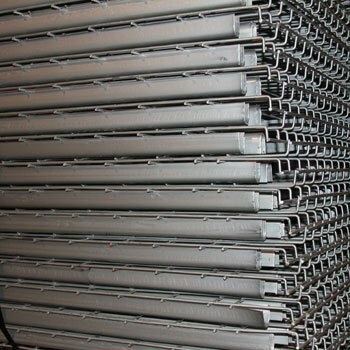 It is a less expensive option than double waterfall and is recommended for inventory that isn’t placed deep into the pallet rack. 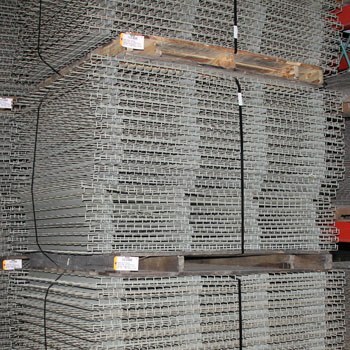 Double Waterfall's wire mesh is bent 90 degrees on the front and back and rests on the outside of both pallet rack beams. It is ideal for all types of inventory. 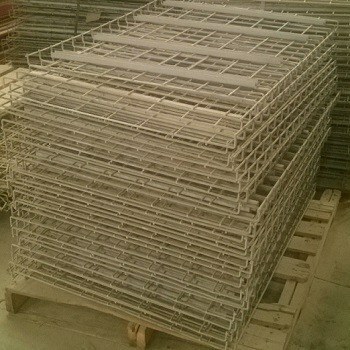 Flush decking's wire mesh ends flush with the channel to drop into pallet rack beam step, providing a seamless surface area. 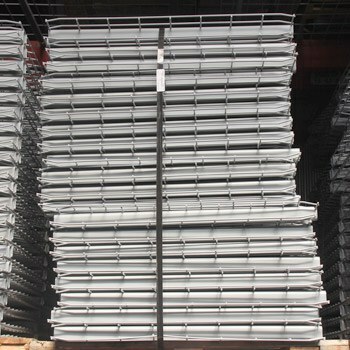 It is often used when storing heavy inventory as it allows capacity markers to be visible on the face of the beam. It can also provide easier storing and picking for high turnover inventory. The installation of this deck style usually requires mechanically fastening it to the step of the beam. 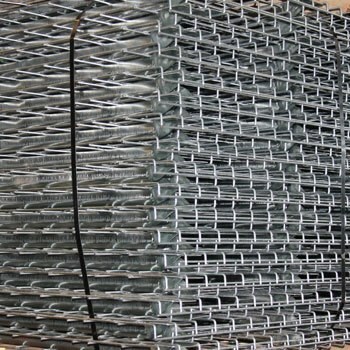 Inside Waterfall decking is similar to flush deck, but with the wire mesh bent 90 degrees front and back to sit inside the step of the beam. This style should also be mechanically fastened to the step of the beam and has less capacity than flanged waterfall. Universal/Flange/Flared Channels are identified by flattened wings expanding beyond the width of the “U” channel at each end. The flanges rest on the top of the rack beams. This channel style will fit all (1 5/8” Step, 3/4” Step, Box and structural) beams. 1 5/8” Step or 1 5/8” Channel fits into a 1 5/8” Beam Step. 3/4” Step or 3/4” Channel fits into a 3/4” Beam Step. U Channel is identified by a “U” shaped channel. Inverted U Channel is identified by an upside down “U” channel. 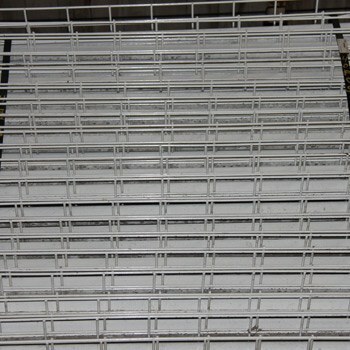 The Inverted U Channel eliminates the buildup of dust and grime inside the channel and is required for businesses in the food and beverage industry. Our in house experts can help you identify the right deck for your specific application and provide you with both new and used pricing options. Q. 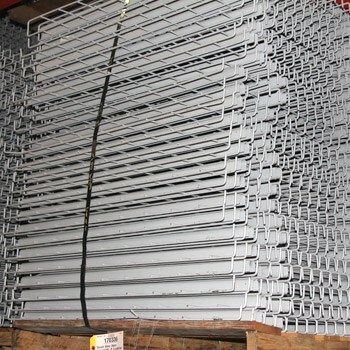 What size wire deck do I need for my pallet racking? A. 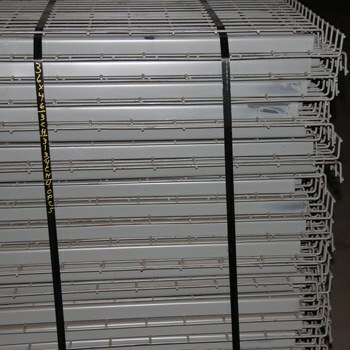 There are several measurements that you will need to identify before you order wire decking. First, you will need to measure the distance from the outside of the front column to the outside of the rear column of the rack upright. The second measurement will be the horizontal distance of the beam between the two vertical uprights. The final measurement you’ll need is the distance between the steps on the beams if you have roll form style pallet rack. 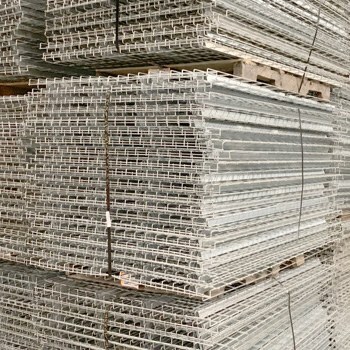 Our in-house design experts are here to help you select the correct depth, width, and channel support size for the pallet rack you are purchasing. Q. Why are there different channel supports on wire decking? A. 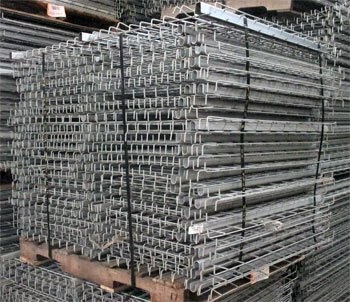 Wire decking is available with several styles of support channels. A standard full step or cut channel style generally has 3 U-shaped channels facing upward and the channels rest on the step of the beams. Another popular style deck is referred to as Universal Flange. Like the name infers, these decks are made the fit all types of different beam styles, from step beams, to box style, and even structural beams. 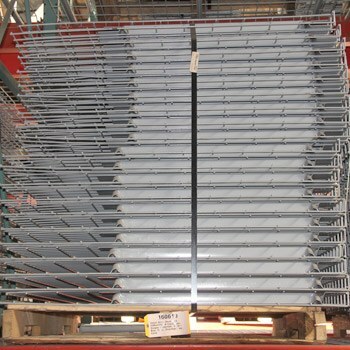 An inverted channel wire deck is most commonly used for food application. The U-shaped channel is face down so food or other debris does not collect in the channel. Q. What is the most common grid pattern on wire deck? A. Most standard wire deck is available in a 2” x 4” pattern with 6 gauge wire, but many other patterns and gauges are also available. 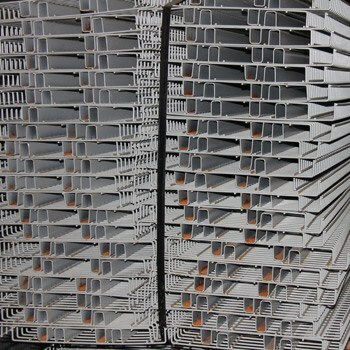 Our in-house design experts can help select the right wire deck at the right price for your specific application based on capacity, product to be stored, picking method, and budget. Q. What kind of wire deck accessories are available? A. 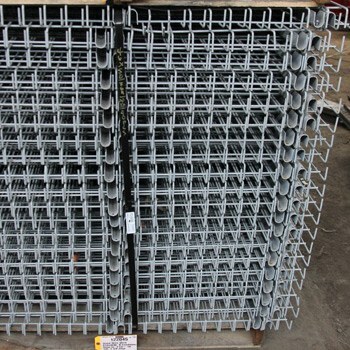 The most common type of wire deck accessories are wire deck dividers. You can use these dividers to create product storage lanes from front to back, side to side. 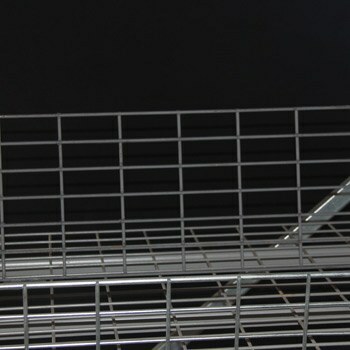 Middle dividers allow picking from both sides of the rack. 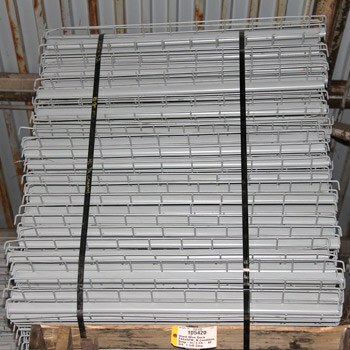 Wire deck back stops keep product from falling off the back of the pallet rack.